When I reviewed Mark Buxton's Wood & Absinth last week, several people mentioned another vetiver + anise fragrance, Kenzo Air (or Kenzoair, as I believe the brand prefers). How I made it all this time without smelling Kenzo Air is a bit of a mystery to me, but I suppose the name "Air" was not all that appealing? Obviously I needed to smell it, and since it didn't seem to be available locally (and it's too cold to go outside anyway), I ordered some right away. I'd like to point out that I made it a full 13 days into 2009 before breaking rule no. 1 (or no. 2? I can't remember) and buying something unsniffed, but this was cheap enough that it wouldn't have killed me if I'd hated it. And lo and behold, everyone who commented was right: it's wonderful. I posted the tv spot last week; it's a nice fit with the ad copy, although how all of that resonates with the juice itself isn't really clear to me except that like many of the fragrances in the Kenzo line, Air is more sheer than not, and yes, it isn't so "macho" that a woman couldn't wear it. It was developed by perfumer Maurice Roucel, and originally released in both Eau de Toilette (notes: bergamot, anise, vetiver, woods, amber) and Eau de Parfum (notes: angelica, cumin, vetiver). The Eau de Parfum does not appear to be available these days, but an Eau de Toilette Intense with similar notes launched in 2005. Kenzo Air doesn't have much presence, so I can also imagine that perhaps I sprayed some on a card one day and proceeded to forget all about it. The opening is crisp and bright, and Kenzo Air pretty much stays that way for the duration. The anise is light but there's probably enough there to dismay all you licorice-haters; the vetiver is loamy-earthy, but as airy as vetiver can be and still smell like vetiver, and it has a green, sappy undertone rather like pine needles. I like it very well, but I'm guessing I'll reach for it most in the heat of summer, along with my other summer vetiver favorites, Guerlain Vetiver & Paul Smith Story. A few vetivers that stand up nicely to winter weather: Hermès Vetiver Tonka, Frederic Malle Vétiver Extraordinaire, Lalique Encre Noire. Worn next to Kenzo Air, the Mark Buxton, unfortunately, smells overwhelmingly bitter and soapy, and sort of plodding. 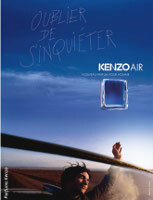 I have not smelled the Kenzo Air Intense, but if you have smelled that or the original Eau de Parfum, do comment! I do not know what the original bottle was like (it looks nice enough in pictures), but mine is essentially a block of frosted plastic with some blue (glass?) inside. It's pretty much hideous. You can easily find Kenzo Air at a discount. My 20 ml bottle cost around $16 at Fragrancenet, and it also comes in 50 and 90 ml. Note: image at top left via imagesdeparfums.fr, at top right via osmoz. See also: a review of Kenzo Air at Bois de Jasmin. Update: Thanks to Kevin, I've now had a chance to try out Kenzo Air Intense. Air Intense lists the same notes as the original Air, but adds cumin and angelica. It is not a strikingly stronger fragrance than the original Air, in case that's what you're after — to my nose, it still qualifies as "more sheer than not" — although it does have just a bit more presence and lasting power. While I am most decidedly not a fan of cumin or angelica, neither is overwhelming here. The cumin adds a touch more spice and just a touch of that sweaty undertone that cumin lends...I don't find it too much, and if they had amped up the anise and vetiver, it would be a winner. Sadly, they really haven't, and I find that I prefer the original. Do see the comments below though — some people definitely prefer the Intense. My simple advice to anyone ordering unsniffed: if cumin and angelica appeal to you, buy the Intense, if they don't, buy the original Air. Ah! So glad you liked it. I think KenzoAir deserves to be in that category of “unsung treasures” because it can be had so inexpensively. I'm glad I discovered it accidentally by throwing it into my cart when buying some minis last summer. Roucel — that explains a lot; I like a lot of his creations. I haven't seen one of the large 50ml or 100ml bottles in person (the mini is a plastic splash thing that makes a big mess), but I think it would be beautiful if done all in glass. Many on the boards comment on it being like a work of sculpture — I like it, at least from what I can see. The boards also indicate that some don't find the Intense much different from — or not as nice as — the original. I'm sure I'll pick up a 50ml bottle in the next couple months (can be had for under $30) and I think I'll go for the original. Thanks for the review! One of my favorite vetivers, along with Sycomore (and coincidentally, I just nabbed a cheap mini of Encre Noire earlier today). The bottle is hideous and way, way too wide even for my big mitts, but I do love the juice. I am so glad you like it too! Well the 20 ml is also in plastic — maybe the larger bottles are the nice glass ones? I didn't get the intense because I don't love cumin or angelica, but I wouldn't mind a stronger version of this one at all. Sycomore would be one of my summer favorites too if I had a bottle, but I don't. Do hope you'll like the Lalique! Thank. God. I knew you'd love it! Aren't EdP and Intense the same thing? No? I thought they were anyway. I'm pretty sure that the spicier (more angelica than cumin) & smokier (less sheer and liquorice-sweet than EdT) Intense, which is lovely nonetheless, is housed in a glass bottle w/ a deeper shade of blue. Not sure which I like better, will have to try them side by side again. And once again ~ yay!!! Yeah, I'll make do with decants of Sycomore ever after… 250ml? No way, no how. And I sniffed Lalique at Aedes… nice, but a mini will be enough for me. Perfect timing on this review- I've got the winter blahs and am starting to brainstorm about fun new scents for spring. I love Anisia Bella, but it's very cedary. Then there's Etro Anice, which is nice but I don't love it. And Caron Eau de Reglisse, which is also nice but I don't love it. And Serge Lutens Douce Amere, which is possibly too heavy for spring. I know there's more…will be back when I think of them! Oh — Hermes Brin de Reglisse. Lovely but a bit odd, and expensive. Wish I had a bottle. R…I thought you were a Cedar fan? Will have to go and sniff this K Air. Love cedar! Just a warning in case someone else doesn't. The frosty, ice-block is glass. This is the perfect scent to give the over-applier in your life. I am on my third bottle of the eau de toilette. I consider it a secret gem. Last year a fragrance aficionado friend swore she couldnt imagine anything better for winter on me than Hot ALways. She couldnt place Kenzo Air and it drove her crazy. It never knocked my socks off initially, but I find myself reaching for it consistently as an everyday fragrance for its uniqueness and subtlety. As said, I am on my third bottle. I also own Etro Anice but use differently, such as a single spray my chest after a shower. Thank you. I'm headed to the mall tomorrow and you've reminded me that I need to smell this. I blew it off probably for the same reason you did – Kenzo is light enough already, so I figured Air would smell like nothing! I do think the bigger bottles are glass and rather pretty. Yes — it'd be hard to overdo! Have you ever layered the Kenzo & the Etro? Actually, now I'm wondering if you couldn't layer Anisia Bella w/ one of the heavier vetiver scents. M, while you're at it, please give Jungle PH a whirl, too. Can't remember that you did & would love to know what you think. Hope you'll find it! Now I sort of wish I'd paid a little more & bought the 50 ml. This thing is not only ugly, it's one of the worst bottles for decanting I've ever had. Is DC vaguely back to normal today? I thought Kenzo Air was boring almost beyond human endurance (not everyone agrees with me, obviously), but Anisia Bella is gorgeous–fresh and airy, anisic but not at all licorice-y, grounded by a hint of root vegetable (like a fresh parsnip) and a bit of wood. It's so nice! I bought it unsniffed from a discounter (Imagination Perfumery) and it turned out to be a very smart buy. 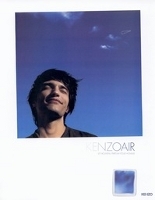 Robin, I love KenzoAir. It's one of that unpretensious fragrances, that makes you feel good on hot summer day. To me, the intense version, the one i own, is all about anise, vetiver and cumin. The cumin gives it a little bit sweaty thing, but to me the key here is the dance between anise and vetiver. On the intense version, is like they play wih each other in the air, with sometimes the anise showing its bright side, and with sometimes the vetiver giving a airy, sheer woody leafy thing. It really makes me feel like a childish, one moment in my life that sometimes i miss a lot. And the bottle is stuning, it really looks in the intense version like a piece of the sky in a summer day. I recommend the intense version, that is much better then the original one. LOL at “boring almost beyond human endurance” — sounds like the makings of a poll! Still can't believe they discontinued Anisia Bella. Oh dear, you're trying to make me order the Intense unsniffed, aren't you? That's a MUCH nicer bottle than mine. Mine looks like a kid's plastic toy. Are all of the Kenzo 20ml that ugly? I ask because I just received the 20ml of Kenzo Flowers that I ordered and it's in this horrible ugly plastic blob. It was a tester, so I didn't pay much; I just wasn't expecting the sheer ugliness of it. Robin, thanks so much for your suggestion on layering Guerlain Vetiver with another perfume in another thread. It worked very well ! Did you like Kenzo Flowers ? Cynthia, I don't know — too bad about the Flower since the larger bottle is so pretty! Good, glad it worked for you! LOL — that's kind, but no worries — it's cheap, and I think you've inspired Kevin to order it unsniffed! I'm pretty sure that I remember liking it, but it's been awhile since I tested it. It was pretty inexpensive and I was trying to hit the magic free shipping total on my order, so I threw it in my cart. I'll probably test it again over the next few days, but I have a cold and can't smell anything right now. I decided to wear Burberry Brit Red today because it's cold here and it make me feel cozy. All those comments about the hideous looking bottle! The bottle design won a best design award in Europe following its launch! True, but my bottle is clearly not the original design! Glad you found it, plus found a good deal on it!